1. Honor the site with one's presence. Just be there! Ocean, sand, wind, sun, people cycling, people playing, birds, boats, waves, and more. Watch people becoming transformed from grounded humans to flying humans. Let not such a scene be without you! Such is one way to be a friend to Dockweiler gliding. 3. Remind your vacationing friends from any state or nation that they in one session at Dockweiler may become a member of an elite faction of humans: gliding like a bird. . "You are welcome to visit Dockweiler Hang Gliding Center during your vacation visit to Los Angeles!" Dockweiler State Beach is adjacent to beach side of LAX. 4. Arrive to fly Dockweiler. 5. After you do fly Dockweiler, consider telling someone about your personal experience. 6. Configure photographs of site details. Share those photographs in our forum. 7. Find enhancing tasks that become options for Friends to accomplish. 8. Discover what Windsports wants with regard to the landing field large depression or dimple in front of the north launches. Report carefully Windsports' wish. Set up plan to accomplish the wish, if any. 9. Design an URL card set. Have one that includes the URL of FDGS and Windsports. Have one that has just Windsports (maybe Windsports would supply their card). Have one that has just FDGS. 10. Distribute URL cards (business-card size) to all businesses in El Segundo, CA. 11. Distribute URL cards to all businesses in Venice. 12. Distribute URL cards to all businesses in Santa Monica. 13. Distribute URL cards to all businesses in Redondo Beach. 15. RC bubble maker? Trigger bubbles to be released when wanted via RC to a bubble-making machine near water's edge. Let the wind drive the bubble machine. Last edited by JoeF on Fri Jun 12, 2015 6:04 pm, edited 1 time in total. All, please consider continuing the ordinals for the list. What have you? 17. Indicate to friends and associates that the beach to the sides of the DHGFC is available for recreation, the ocean for swimming, the wind and ocean for kiteboarding. One among a group might be taking first flights! 18. Info notebook at the plaque: Pages showing many aspects of the site. Pages may be composed and added to the notebook. Visitors may page through to find interesting things about the site. History. North and south restrooms. Lifeguard stations. And more. Pages will need replaced and/or renewed. Keep the notebook alive with current information, maps, directory, leaflets for Windsports, URL cards for FDGS. 19. Clear sand off the circle road that goes around the Windsports office and storage container. Move the sand a bit so the sand does not fall so quickly into that road. 20. Clear sand off the main walking path from parking lot to the plaque patio. 22. Keep aware of spectators. Ever be polite. Many will not be wearing helmets. Smile ; indicate that a good distance from the HG will keep heads from being bumped. 23. Siting inclinometers with imprint of the FDGS URL may be made and given to those interested in such devices. Leaflet or URL with explanations may be composed and published. 24. Join an arch-kite team. Present arch kite at wet-sand line to provide a special backdrop for photography of HG flights; the two anchors would be well set (soft-anchor technology); the arch kite would be of various proven-flight designs. Notice that the arch load line will not interfere with the flight paths of HGs. Fly such arch kite system only when the wind is fairly normal to the surf's line. 25. On Mondays or/and Tuesdays, fulfill any wishes that Windsports might express as regards the large-scale depression in the sand landing field. Last edited by JoeF on Fri Jun 12, 2015 8:46 pm, edited 2 times in total. 26. When visiting, stay aware of any hazardous situation or arrangement regarding people, wings, things, ... and take some polite action or report such to others. 27. Join a team to explore using a taut long sheet of sturdy textile for use for wing running. Do such in a manner that does not reduce the HG flight opportunities; the activity may be done just to the side of the HG landing zone. It is a strong challenge to run in dry sand; the taut sheet may permit better traction and higher run speeds. 29. Similar to 28 for the Falcon II. All, please keep ordinals going when you post some way to being a friend to Dockweiler Gliding. Thanks. 31. TEN WAYS to verify that one is hooked into the glider? Or more. Make a poster. Laminate it. Or/and a small sticker or card. Put FDGS URL on the sticker. 32. Fill LZ divots, holes, depressions. Use shovel, rake, bucket, drag device (could be a great way to build quadriceps for the hang gliding wing running for launching and landing. Kids dig holes. Lifeguard vehicles make grooves. 33. Identify the plants at the Dockweiler slope. Photographs, species identification, population density. Desire of the park authorities about the plants? 34. Poster showing the steps of making a glider from sporadic bird feathers found at the Dockweiler Hang Gliding Flight Training Center. 35. Piece together the dried remains of Velella to make a small model hang glider and/or unmanned small model kite. Photograph and use the wonder to tell about FDGS. 36. Imprint toss rings with the URL of Windsports. And also Friends of Dockweiler Gliding Society. 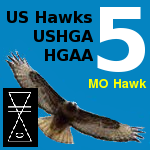 And US Hawks. 37. 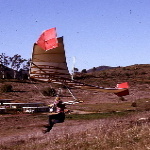 Imprint model hang gliders with the URL of Windsports. And FDGS. And US Hawks. 38. Imprint tee shirts with Friends of Dockweiler Gliding Society ... and URL of Windsports. Find ways to get the tee shirts out to the world. 39. Imprint unmanned small kite systems with Windsports, FDGS, and US Hawks. Or have stickers that may be bonded to such kite systems. 40. Answer questions that spectators have. I do not suggest the feather glider idea unless all feathers are from domestically raised birds (chickens, turkeys, etc.). Unless you are a Native American Indian, with a U S permit, it is illegal to have in your possession any other feathers, even if you picked them up off the ground. The Friends of Dockweiler Gliding Society would not condone or approve any illegal feathering action. fcolver wrote: I do not suggest the feather glider idea unless all feathers are from domestically raised birds (chickens, turkeys, etc.). Unless you are a Native American Indian, with a U S permit, it is illegal to have in your possession any other feathers, even if you picked them up off the ground. I retract the first version of "way #34". Make gliders and paint images of feathers on some. Others may expand mod of way #34. Thanks for the researched links, Joe. That provides a lot of good additional information to my posting. Interesting factoid: 90% of all "California Gulls" seen at the coast, from Oregon to Mexico, were born on Mono Lake.